So we all live our lives in the way we want to, but should we and what are the consequences of a lifestyle that is contrary to God’s will? 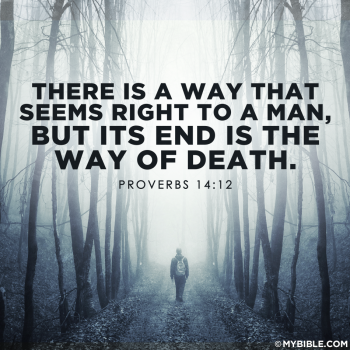 We can get an indication of what will happen by reading Proverbs 14:12. Now this is an interesting verse for a couple of reasons. Now we have to remember that the Proverbs were mainly written by King Solomon, probably the smartest man in the Bible, and possibly in all of history His words, written around 700BC, still apply today. And Proverbs 14:12 was so important that it is repeated again in Proverbs 16:25. So obviously Solomon wanted us to understand what he was telling us. So if you make life choices that are contrary to Bible teachings, will you immediately die? No, probably not, in fact if we go back further in history, we know that Adam was told in the Garden of Eden, that if he ate from the Tree of Knowledge of Good and Evil, he would surely die, and yet he lived man years after his disobedience. So you will not immediately die, but you will die! “So what?” you say, everyone dies eventually. And while that is true, because man is not immortal, that is not what the verse is teaching us. In fact what Solomon tells us is that if you choose to live life your way, then you cannot live in the Kingdom of God after death. Therefore you would die the second death and not have eternal life. So do you want to live a life of about 80 years on earth, or a life of eternity in heaven? The choice is yours, but decide soon, unless the choice is made for you.